PGS ( preimplantation genetic screening, using CCS or NGS) is one of those techniques that seems to make a lot of logical sense. We know that older patients have a lower chance of getting pregnant with IVF. Because their eggs are older, they have more genetic problems as a result of aging. This is why more of their embryos are genetically abnormal, even though they may look fine under the microscope. When we transfer these genetically abnormal embryos into the uterus, they fail to implant; or even if they do implant , this usually ends up in a miscarriage. This is why older women have a lower IVF success rate, as well as a higher miscarriage rate. Therefore, logically, it makes sense that if we use PGS for aneuploidy screening for these patients, we'll be able to discard the genetically abnormal embryos and if we then selectively transfer only the genetically normal embryos, they have a higher chance of getting pregnant. Because PGS makes logical sense, this has become the fashionable treatment option for lots of older women - especially older women who have failed IVF cycles. The doctor tells them that they need to do PGS to select a genetically normal embryo , and thus reduce the risk of failed implantation. However, this often doesn't work out well in real life . Older patients often have poor ovarian reserve, and therefore, poor ovarian response. 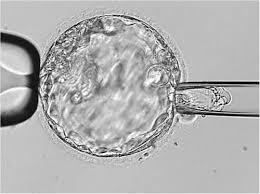 As a result, they end up getting few eggs, and very few of their embryos end up making it to the blastocyst stage, as a result of which our ability to do PGS and get reliable genetic information from these blastocysts is very limited. This means that even if we intend to do PGS for 100 older women, the actual number for whom PGS can actually be utilized becomes very small. However, women don't understand this, as a result of which they're quite happy to sign up for the program. Doctors are happy to offer PGS because they can charge much more for a PGS cycle. Even if they don't get around to being able to transfer a genetically normal embryo, then at least they can tell the patient "We did our best, and we tried to go ahead and do a biopsy, but because your embryos arrested / or because they formed blastocysts of poor quality , we could not do the biopsy, sorry. " In other cases, we can manage to do the biopsy, but we fail to get any useful diagnostic information from the blastomere because of technical limitations. While it's true that PGS can be helpful for a small proportion of older women ( those who grow lots of eggs and form enough good quality blastocysts) , the reality is that PGS has its own limitations . It's not something which can be blindly applied across the board , and patients need to understand this before signing up.